I had the analog version of this mic, and it did a great job for me over the years. No battery required and an easy connection with nothing to worry about. Until the audio quality failed on me on a recent trip. So I decided to try this digital version of the iRig Mic which plugs into the digital input on iPhone 6, allowing me to plug headphones into the headphone jack of the iPhone. This let monitor audio quality in real time. I really did miss being able to do that with the old version of the mic. iRig Mic HD sports a 24-bit audiophile-grade A/D converter, a 44.1/48 kHz sampling rate and a low-noise/high-definition pre-amp. 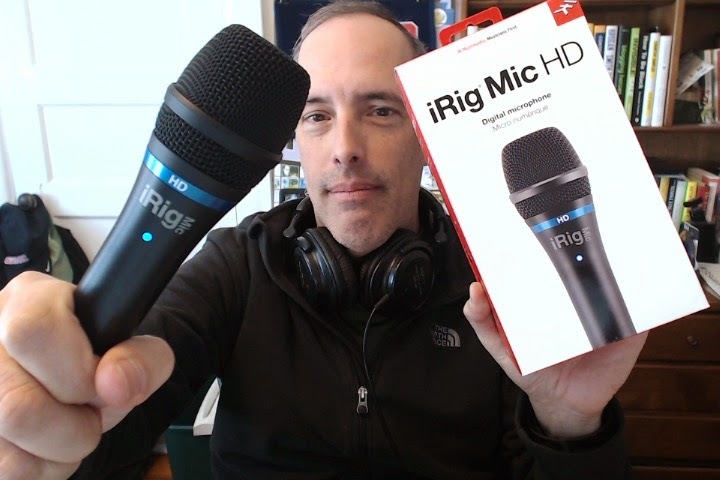 iRig MIC HD comes with a full suite of apps that let you start processing and editing vocals (or any other audio source) straight out of the box. iPhone, iPad and iPod touch users will enjoy: VocaLive FREE*, a real-time vocal effects processing and multitrack recorder app. iRig Recorder FREE*, a professional field recording and audio processing app. And AmpliTube FREE*, a recording and studio app that features stunningly realistic virtual models of some of the most desirable amps, cabinets and stompboxes of all time. iRig Mic HD also comes with the free version of AmpliTube for Mac and PC and many other powerful IK apps. My test, recorded with VocaLive FREE, uploaded to Soundcloud. Next test will be with iRig Recorder. QUESTION: What App do you use to record AUDIO on an iPhone? I shared to Soundcloud. You have to sign in under the settings with a Soundclud username/password.